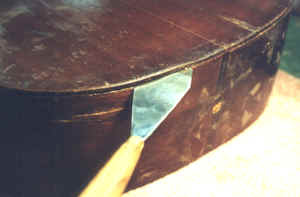 The chisel is in the photo to suggest another very effective (but frightening to beginners) method of removing bridges. The chisel is sharp, and the bottom (i.e the flat or non-beveled side) has a very slight bevel on it so it will not dig in. We then simply put the chisel at the edge of the bridge and give it a good whack. Do this all along the edge on both sides and the bridge will come off quite cleanly. I first learned this technique from Stu Mossman, and when he showed me I just about fainted since it looked so dangerous (to the guitar). But it works. I recommend that beginners not try this on good guitars until they have practiced and, even better, seen someone with experience do it. Here is another photo of the top with the bridge removed. 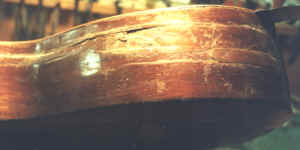 It helps to show just how badly damaged this instrument is. Here we are beginning to remove the back. 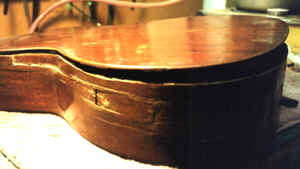 The back was originally glued with hot hide glue -- and although it has been very badly repaired over the years, most of that work was done with hide glue (lots and lots of it). This makes the process easier since a little heat and moisture will enable us to separate the glue line. We use a broad palette knife to apply the hot water and to separate the joint. 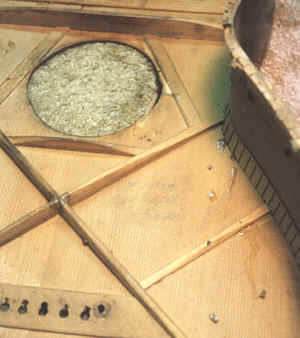 Here is a photo of the treble rib -- as you can see it is too far gone and we will be replacing it.. Here the back is almost off. One thing we found when we got the back off is that it is initialed and dated on the top with the initials FHM - which we believe was Frank Herbert Martin. Way cool. This photo doesn't really show it, but it is there - very faint. 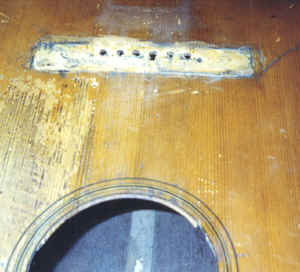 This photo shows one of the major challenges in this restoration. The linings are very delicate, and since I will be replacing one rib, I will have to salvage the existing linings or find a way to duplicate them closely. This one will take a bit of thinking.